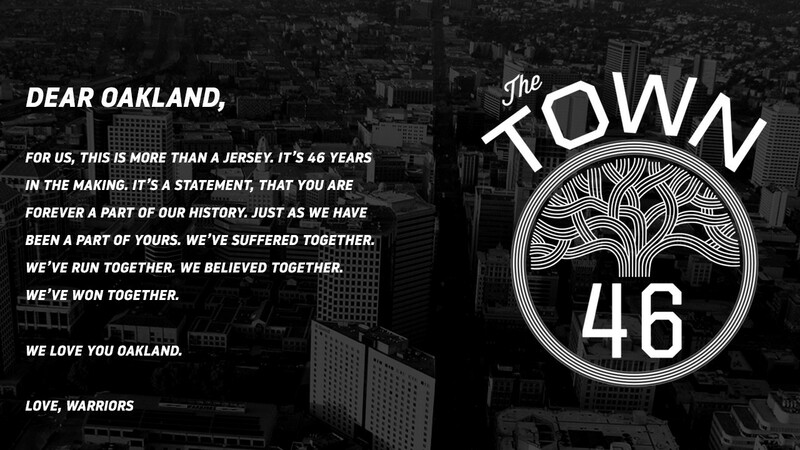 The team's new Town jerseys and logo finally recognize Oakland after all these years. But they mean nothing if the Warriors refuse to pay their $40 million debt. The Golden State Warriors have delivered baskets of joy to East Bay hoops fans in recent years, winning two championships and coming very close to capturing a third. Warriors' head coach Steve Kerr and team superstars Steph Curry and Kevin Durant have also made the liberal East Bay proud by speaking out forcefully against racism, inequality, and gun violence, while thoughtfully criticizing President Trump and his far-right agenda. And, after more than four decades of disrespecting their home city, the Warriors also recently officially recognized Oakland for the first time, unveiling new jerseys emblazoned with the Town logo, featuring the iconic Oakland oak tree, and painting that same logo on the Oracle Arena floor. Yet the team is set to throw away that good will — or least seriously damage it — out of stinginess, or worse, just plain greed. The Warriors have decided to take the cash-strapped city of Oakland and Alameda County to arbitration this year in order to avoid paying $40 million in bond debt on Oracle Arena when the team leaves in 2019 for its new $1 billion facility in San Francisco. It's frankly a shameful move considering that team owners Joe Lacob and Peter Guber are billionaires and the city of Oakland can't scrape together enough money to house its growing homeless population. And if the Warriors win the arbitration case, the city and county likely will have to slash public services — like libraries and parks and recreation centers — in order to pay the $40 million. What's most outrageous is that the Warriors clearly owe that debt. It was originally created in 1996, when the city and county acceded to then team-owner Chris Cohan's demands for a complete refurbishment of the arena. Worried about losing another pro sports team, local officials, operating in their capacity as members of the Oakland-Alameda County Coliseum Authority, floated $140 million in bonds to pay for Cohan's arena upgrades. And then they signed a lease deal with Cohan, calling for the Warriors to pay back those bonds from premium ticket proceeds. Ever since, the team has paid the authority about $7.4 million a year toward the bond debt and the accompanying interest payments. Currently, there's about $55 million in bond debt left, and when the Warriors depart for San Francisco for the 2019-20 season, it's expected to be about $40 million. City and county officials contend that the Warriors' lease requires the team to pay the debt in full when they move. But Lacob and Guber say that when they cross the bay, the $40 million becomes the city and county's problem. Clearly, lawyers on both sides think they have a winnable case. And an arbitrator is expected to decide who is right this summer. But the fact that Lacob and Guber are fighting the city and county over a debt that they demanded the public agencies incur speaks volumes about their true character. Oakland and its fans don't deserve to be treated so badly, especially considering the fact that they've steadfastly stood by the team even when the Warriors were terrible. Fans regularly sold out the arena for years no matter how poorly the team played. And then the city council, without hesitation, agreed to put the public purse at risk when Cohan asked for the arena upgrades in 1996. And yet 22 years later, the Warriors are prepared to inflict serious financial damage on their host city. The Warriors' departure likely will leave Oakland with no viable revenue streams to pay off the $40 million. Plus, a 2015 study from San Francisco State University concluded that the Warriors' move would cost Oakland 805 jobs and $87 million in lost economic activity each year — from arena concessions and labor activity to other direct and indirect revenue that the basketball team produces. And the author of that study, Professor Philip G. King, told our sister publication, Oakland Magazine, in 2016 that his estimate might have been low. King explained that Oracle Arena will have difficulty competing against the Warriors' new facility for non-basketball events and acts. Big-time performers like Lorde, for example, who is scheduled to appear at Oracle next month, will undoubtedly book future shows at a glistening, $1 billion arena on the San Francisco waterfront. "If you have a choice between San Francisco and Oakland, you're going to choose San Francisco; it's a new arena," King said. Plus, many performers who might want to also play in Oakland could be prohibited from doing so because of so-called "radius clauses" that forbid acts from appearing in nearby venues. Such clauses are common in the entertainment industry. As a result, Oracle Arena could go dark after the Warriors move, leaving the city and county with no way to pay off the $40 million — other than from their general fund budgets. For Oakland, its share of the arena debt would be about $3.7 million a year (that's on top of the $10 million it already pays annually to retire the debt on the next-door Coliseum). For a city short on funds, $3.7 million is a lot of money. Without it, Oakland will have to cut services, and it certainly won't have enough for new shelters and housing for the thousands of people living on city streets each night.